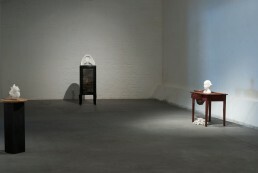 From May 4th until May 27th Forum Box presents visual artist Kaisaleena Halinen’s exhibition Pro et contra. The exhibition will be Halinen’s most extensive solo exhibition up to date. In the exhibition Pro et contra the viewer encounters different figures, or human-like pieces, which all have something to tell or something to hide. The pieces consist of concealed stories or referential statements. We recognise feminine attributes in the figures, but they are concealed or hidden. We can identify even violent attempts to efface the feminine. 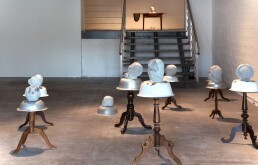 Kaisaleena Halinen offers the viewer riddles and various questions. 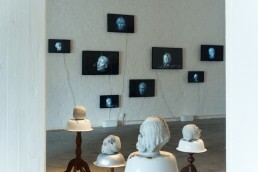 Face and identity are the focal points of many of the works. 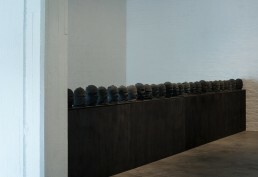 The faces are either purposefully covered or the figure’s face has been bereaved from them, such as in the piece Kasvonsa menettäneet, where the artist washes the features of the molded concrete heads. When your characteristics, and by that note, your identity, are being effaced: what will be left? 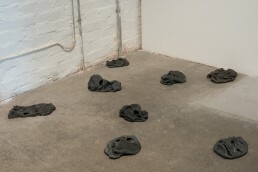 The exhibition title piece, Pro et contra, is depicting a row of figures wearing commando beanies in the Permanto space. 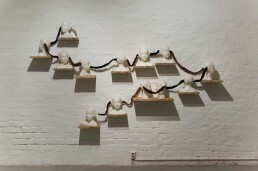 The figures block the space and demand the viewer to take their place. The viewer has to decide: will they stand by or against the anonymous crowd. The viewer cannot bypass the demand and there are no options: the mere existence of the viewer places them either pro or counter. But pro and counter what? Jacques Rancière, one of the most remarkable contemporary philosophers of our time, states that art, like politics, is primarily about dissensus (Le Dissensus); the disagreement and the struggle concerning our shared world’s limitations. Rancière states that art has political capacity, because it makes visible and redefines the inaudible and agents that are positioned outside of the mutually defined. Art reconfigures the distribution of the sensible. It challenges established, pre-defined positions, and reconfigures the limits of the perceivable world. In doing so, it creates possibilities for new voices and agents. It poses the question: who has the right to speak and act and who will be left with a passive role and mute. Whatever your position, it is always in relation to other agents. In her exhibition Pro et contra, artist Halinen creates multidimensional and intricate references to the contemporary social atmosphere, while skillfully commenting on history writing, art history and the construction of narratives. The exhibition has been supported by Finnish Cultural Foundation and Arts Promotion Centre Finland.